Stack’s Bowers Galleries is proud to present selections from the William Porter Collection, Part II, at the June Whitman Coin & Collectibles Baltimore Expo. Highlighting the collection is an 1879-CC Morgan dollar graded Mint State 65 by NGC. The 1879-CC dollar is the second rarest of all Carson City issues of the Morgan design and an example in any grade always attracts a lot of attention when offered. The MS-65 level just adds excitement. In comparison to the hundreds of thousands of Morgan dollar enthusiasts, relatively few examples are available with this grade classification. This beautiful 1879-CC dollar displays mint frost radiating across the fully brilliant surfaces and is well struck and free of the bag marks that are frequently seen on Mint State Morgan dollars from the Carson City Mint. If not for a few trivial nicks and faint luster grazes (located almost entirely on the obverse), it no doubt would have received a higher grade assessment. Here indeed is an important opportunity and we expect bids to come from all directions! Carson City Mint expert Rusty Goe estimates that between 17,000 and 19,000 of these 1879-CC Morgan dollars exist today, with perhaps one-third of those in Mint State—mostly in rather baggy condition. Gems have proven to be rare, with the certification services recording precious few at this coveted level. 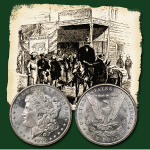 Furthermore, due to its status as the second rarest CC Morgan dollar, demand has always been strong. In fact, way back in 1974 when the General Services Administration offered 3,633 of this date and mint, they sold out quickly and prices have steadily risen ever since. “Key Date, Brilliant Gem 1879-CC Morgan Dollar,” Stack’s Bowers Galleries, accessed May 26, 2013, http://www.stacksbowers.com/Blogs/united-states-coin-of-week-key-date.html.